Along with kid-friendly presentations, Chef David Burke designs fun and interactive recipes for the kids to enjoy. When I think about cooking with kids, I think about what recipes or menus I can create that will involve them in every step of the process. One of my favorite things to do with kids is to give them a bunch of ingredients and the instructions, and let them go crazy without telling them what the end result should be. It gets them excited about cooking and adds an element of surprise to the whole process. Here are some ideas and recipes that will help you get the kids involved in the kitchen more often. 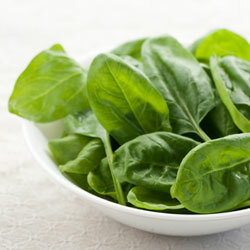 Kids are usually averse to spinach because they’ve probably only tried it cooked, which has a very strong flavor. A handful of fresh spinach has a much milder flavor that they might enjoy, and is richer in nutrients than regular iceberg lettuce. Try swapping the two next time you're serving a salad or making a sandwich — I’m sure you’ll be surprised at how much they like it. This recipe is great for kids because it has simple ingredients and very little process. This is the best way to give kids what they want but also give them something that is good for them. We all know kids love ravioli and ham and cheese sandwiches. This recipe lets them enjoy both, and the assembly makes it fun for them to make. People always love this recipe because they don't usually think of using the skin this way when cooking a piece of chicken. It adds a perfect, crunchy texture, and you won't want to eat a chicken wrap any other way again. Kids also have a lot of fun shaking the bag when seasoning the chicken. I love this recipe because it allows the kids to have the freedom to create what they like but it’s also good for them. They’ll be so excited about creating a lunch with the ingredients that they’ll forget that there are even green beans in there. I also like to get creative with how I package the lunches. Tennis ball sleeves make the perfect lunchbox for a wrap, and sometimes I’ll even pack a lunch in a paint can, which serves two purposes: keeps the lunch from getting ruined and gives the kids an opportunity to decorate their lunchbox.